Nathan Hill puts the new Seneye tank monitoring system to the test. The all-new Seneye is certainly revolutionary, although not without its glitches. Already debates are raging about cost effectiveness — although it’s noted that many of the most vocal critics don’t own the kit! My initial impression, having used the unit, is that I adore the hardware, but find myself seething at the installation and intuitiveness of the software. Patient people — and I am not one — may initially find the Seneye very frustrating. 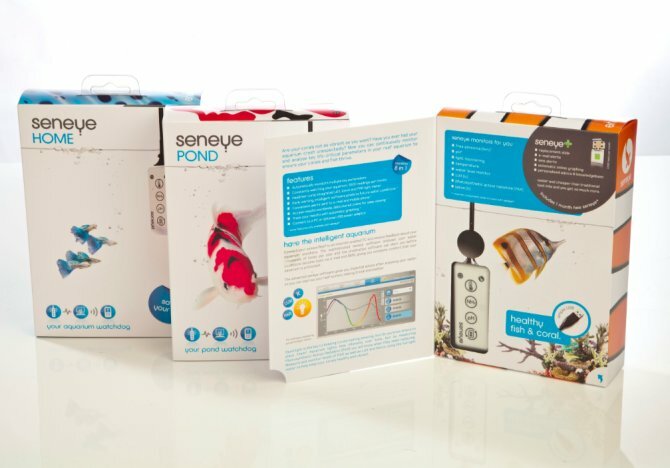 The Seneye is a monitor for the aquarium, which communicates with your computer and the Seneye website to give accurate records of water parameters, as well as predicting problems. The physical element you buy is an optical (eye) sensor (sen) which is placed into the aquarium and connects to your PC via a USB, which in turn powers the unit. This means that to deliver continuous feeds to your computer, the unit needs to be rigged up on a permanent basis. However, if disconnected, it continues to take measurements and store them internally, delivering them to the PC when next connected. Alternatively, it can be hooked up to a wireless USB sender, but this component is not supplied. There are three versions of the Seneye, with potentially more on the way. Current choices are the Home model, the Pond model, or the Reef model — the one I am working with and which I feel has the most potential. All models test for ammonia, temperature, water level, lighting and pH, and record near continuously. The unit communicates with Seneye online every 30 minutes or so and if anything appears wrong you’ll get an email or text letting you know what the problem is. The online side of the Seneye can be frustrating for those who are not computer savvy. Registering the device and initially setting up was — for me — arduous at best, with a few gaps of explanation that really caught me out. The unit requires an hour of connection after registering to allow it to synchronise itself with the online software, installing a clock, and updating the lighting package. Then there’s a gap where nothing really happens before things suddenly spring to life. It’s a real eureka moment when it all comes together, but getting there is quite a test of personal character. Once you’re in, however, it’s very impressive and reveals the reason why these were selling out in stores within two weeks of release. To see exactly what’s going on in your tank, you have two options. You can look at the Seneye connect device with the freshest, ongoing readings, or log in to see the records over a set period of your choosing. Want to see the ammonia trends for the last week? You can do it. Want to see how the temperature has fluctuated over the afternoon? Then you can, and it’s all very straightforward. You can set your own safe parameters on the graphs provided, choosing where you decide the water is too warm or too alkaline, for example, and sit back confident that the unit will notify you if anything falls outside these parameters. That’s not to say you need to be a chemist to understand what you’re programming in. Early on you’re asked, when registering the unit, what tank you have, specifics like size, what you’re using it for: pond or marine tank, for example. This way, the settings automatically align to safe parameters for the scenario. Even if you’re not looking at a computer screen or near your phone, the device has warning lights all over it to notify you if things become a problem. A red light will indicate what has gone amiss and you can act before it’s too late. The reef light package includes readings for PAR, lux and kelvin, enabling you to see exactly what your lights are throwing out at any part of the tank. You can save settings, allowing you to record in advance exactly where the hot spots are — meaning you can plan which corals should be going where. Planted tank keepers should also relish this feature, although the Seneye’s limited downward range of pH detection — only going to pH6.5 — makes it only partly suitable for now. There has been much confusion during the early stages of Seneye’s launch, with forums ranting about 'subscriptions' to the service. The reality is that Seneye is more like a pay-as-you-go arrangement, with no direct debits or contracts that tie you to anything. What you pay for is a sensor chip that goes into the unit. This contains the colour reactive indicators from which the optical part of the unit takes its readings. These chips last for one month and are registered to the Seneye device with an individual code that comes with them. During this time you’ll get the notifications that come with the package, as well as ammonia and pH readings. Outside of it you’ll still have readings for water level, temperature and lighting, but you’ll not get the associated warnings for them. Some have tried to argue that this doesn’t work out cost effectively when compared to pH and ammonia test kits bought separately, yet this misses a huge point. Most testers will do so weekly, not every few minutes. More often than not, when a fishkeeper has a problem, he or she will test after the event and discover the problem — but this is too late. Seneye means that the keeper can be notified before water conditions directly harm the fish — an assured outcome of predictive software that lets you know if it looks like the pH is due to drop, or the temperature is on its way up. This way, Seneye is a real fish saver, as opposed to a forensic examiner, post-wipeout. As a bonus, the Seneye website uses information from the parameters tested to make predictions about other key features of the tank. It can give a guide to total ammonia, where the sensor only checks for free, harmful ammonia. It can give an oxygen potential based on the registered conditions and temperature. Eventually it will read parameters like chlorine, nitrite, nitrate and hardness — although these capabilities are still in the pipeline. These amazing gadgets are just what the trade needs. Anything that can predict a problem in advance is worth its weight in gold and, given the low price of the Seneye, I think this is going to be the 'must have' device for keepers of any sensitive creatures. Like all new products, I think it’ll need to prove itself in the field before more pedantic souls will be won over, but if a single one of those has a wipeout during the time they’re sat on the fence then they’ll truly regret it afterwards. Prices: Home model £59.99; pond £89, reef £99 (RRPs).